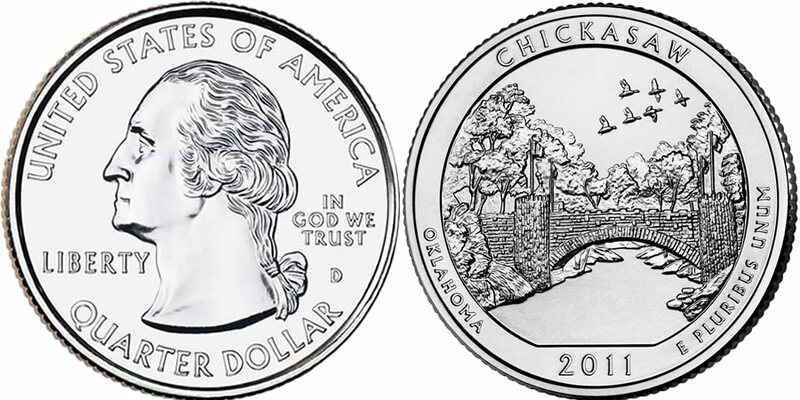 The 2011 Chickasaw National Recreation Area Quarter will be the final 2011-dated release of the America the Beautiful Quarters® Program. This strike honors Chickasaw National Recreation Area of Oklahoma with a design on the reverse. Coins in this series serve as the basis for two other series of coins from the Mint - The America the Beautiful Silver Bullion Coins™ and the America the Beautiful Five Ounce Silver Uncirculated Coins. Both of these other program are struck from five ounces of .999 fine silver to a diameter of three inches, but feature the same basic designs as found on the circulating quarter dollars. Chickasaw National Recreation Area consists of almost 10,000 acres, with 25% of that being covered in water. The area was originally given federal protection as the Sulphur Springs Reservation in 1902 but redesignated to its current status in 1976. Owing to an agreement between the United States government and the Chickasaw Indian Nation which sold the original 640 acres of the recreation area, no admission is charged by the National Park Service to anyone who enters. The inscriptions of "UNITED STATES OF AMERICA," "QUARTER DOLLAR," "LIBERTY", "IN GOD WE TRUST" and the mintmark surround a portrait of George Washington, the first President of the Untied States, on the obverse of all of the America the Beautiful coins. The portrait was originally designed by John Flanagan for the circulating 1932 quarter dollar and has appeared on the quarter ever since. The inscriptions of "CHICKASAW," "OKLAHOMA," "2011" and "E PLURIBUS UNUM" surround an image of the Lincoln Bridge which is found in the Chickasaw National Recreation Area. The limestone bridge is a favorite among visitors and was originally dedicated on the centennial of the birth of the 16th President of the United States, Abraham Lincoln. The reverse was designed by AIP Master Designer Donna Weaver and sculpted by United States Mint Sculptor-Engraver Jim Licaretz.